The newly renovated Grand Palladium Punta Cana Resort & Spa is located in a privileged setting right on the seafront on renowned Playa Bavaro. Built on an estate of 80.000m2 next to the Palladium Bavaro Grand Resort & Spa and the Palladium Palace Resort Spa & Casino, all set in the midst of a coconut plantation and lush tropical vegetation. Located only 20 Km. from Punta Cana airport, the hotel provides its guests with a long beach of fine white sand with a coral reef very near the shore, which will delight scuba divers and sea nature lovers. The resort is the perfect setting for leaving behind daily troubles and spending an unforgettable holiday in the company of family and/or friends. Our trip was great!!!!! We had no complaints! Beach: Great - One of the best beaches we've been to! Pool: Lots of pools. All were nice! Entertainment: The nightly shows were not great. But had a lot to do during the day! Thank you again for all of your help!!! Look forward to working with you again. 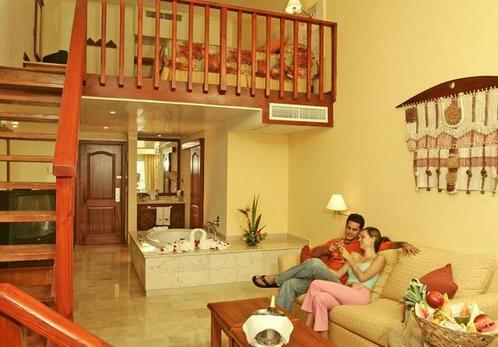 Our stay at the Grand Palladium Punta Cana was great! Everything went very smooth. The only thing would we would change if we get to go back to the Dominican is that we would know basic Spanish so we could communicate with their people a little better. Over all it was a beautiful resort. The Beaches were gorgeous and we got a great value for our trip! Our trip was GREAT!! When we arrived at the airport Saturday morning your friend was there and had all our papers ready. The whole process took less then five minutes. It was so nice being at the gate knowing that we did have a seat on the plane and that we were going to make that flight. When we arrived at Punta Cana Apple was waiting for us and the process of getting on the bus was a snap. No hassle this time trying to get our own transportation to the hotel. The weather was beautiful when we landed but before the bus left the airport it started to rain. It rained all day and all night. They told us that it was a tropical storm moving through. That kind of scared us after being in Wilma in Cancun but the next day it was beautiful. The check in at the hotel was a little slow. We didn't get our room till after 4. We kept going back to the desk and they kept saying 15 more minutes. Monday afternoon they sent us a fruit plate and a small bottle of rum. We loved our room. 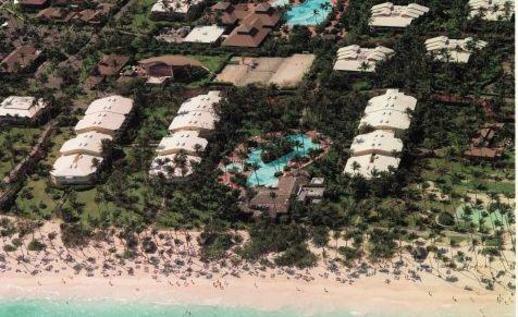 We were in area 75, close to the lobby, pool, buffet, other pool close to the beach, and the beach itself. The hotel was very clean and the food there was the best we have had at an all inclusive. There were several places to choose from for dinner and we tryed several of them. All were good! We really enjoyed the train that they have there to take you around the complex. The place itself is huge so by riding the train we got to see the whole area and got a general idea where everything was located. The beach itself was beautiful. It just seems to go on forever! The only negitive thing about the trip to us were the people on the beach and around the pools selling stuff. They were selling different trips, motorized sports, wanting to take pictures of us at different locations at the hotel and making us an album. We couldn't believe how many of them there were. At Cancun they have a desk by the pool where you go to sign up for all the activities. We just couldn't believe how many of them there were and most of them were selling the same thing. The timeshare people were there but if you stayed near the water when you were walking the beach they didn't come after you. The entertainment at the beach and pools were great. It was all there if you wanted it. We just wanted to relax and do nothing. We did go to the shows at night. Some of them were pretty good. The trip back was also good. We got to the airport, an Apple rep took our bags, we followed him straight to the ticket counter bypassing alot of people and in a few minutes we were all checked in. This was really a GREAT trip! We would go back to this hotel again. Thanks Frank and Marcy for everything! The whole trip went like clockwork. This is the first trip for us that went that way. No more nonrev for us for our vacations.